Get a hierarchical view of your data items with ComponentOne TreeView™ for UWP. 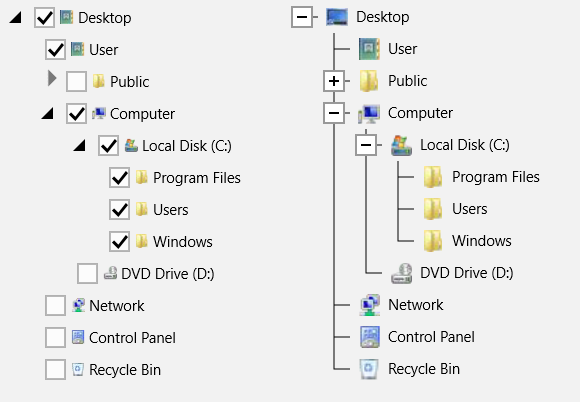 The familiar TreeView UI is now available for Windows 10 applications. TreeView supports collapsible nodes, hierarchical templates, check box nodes, editing, and drag-and-drop operations. Node headers are content elements, so they can host any type of element: add images, check boxes, or anything else your application needs. Provide editing functionality using the customizable EditTemplate property. Set the ShowLines property to show connecting lines in TreeView, giving it the appearance of a classic Windows treeview. Adjust the appearance of the lines with several simple properties, including LineThickness and LineStroke. You can use different templates for different node types without having to subclass the TreeViewItem class. The TreeView control supports drag-and-drop operations within the tree. Set the AllowDragDrop property to True, and users will be able to reorder nodes within the tree by dragging them. Drag-and-drop is supported by touch input as well.